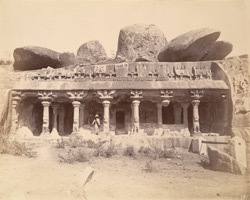 Photograph of the Pancha Pandava Mandapa at Mamallapuram in Tamil Nadu, from the Archaeological Survey of India Collections taken by Alexander Rea in the 1880s. The small village of Mamallapuram on the coast south of Madras, was a very important site in the seventh-eighth centuries as it was the main port of the Pallava rulers of Kanchipuram. The rock-cut and the monolithic temples which were erected by Mamalla (r.c.630-68) and Rajasimha (r.c.700-728) represent the earliest examples of monumental architecture in southern India. This photo shows an unfinished cave temple from the mid-7th century. The columns of the verandah have lion bases a typical feature of Pallava architecture.